La-la-la! LEMON! 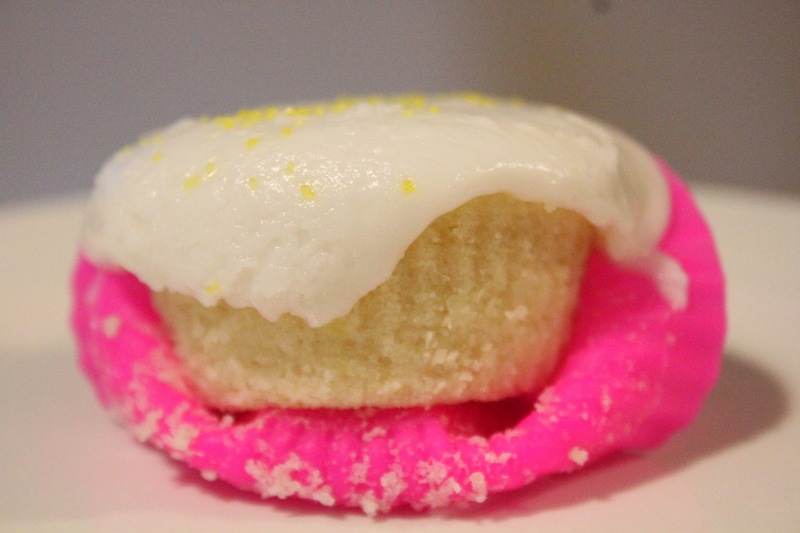 I’m feeling bright and cheery today, so a bright and cheery lemon cupcake fits in just perfectly. 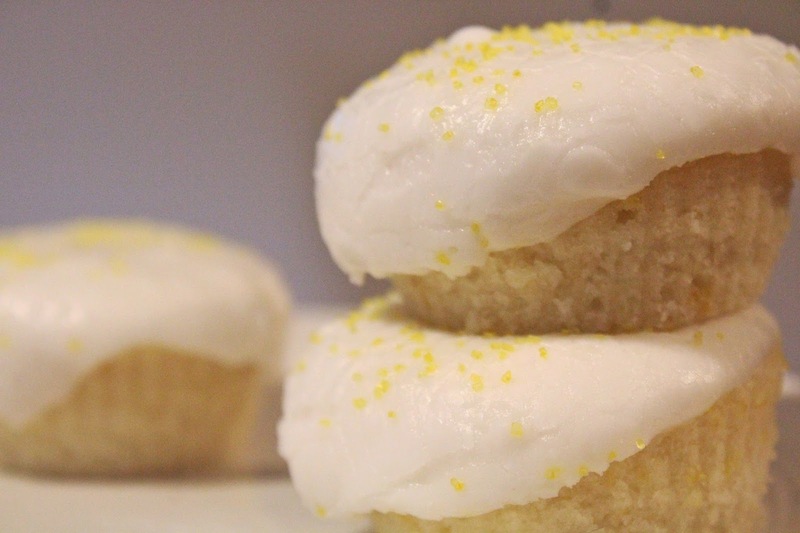 You probably remember me saying in the past how citrus-y desserts rarely catch my attention. Vanilla, chocolate, caramel, cinnamon, red velvet…all top picks above anything citrus like lemon or lime. But more often than not, I am pleasantly surprised by them. They’re refreshing and offer a balance of sweet and tart that you can’t get anywhere else. The kind people at The New York Baking Co. sent me these silicone cups (don’t worry – they’re BPA free! ), giving me all the more reason to bake something special. 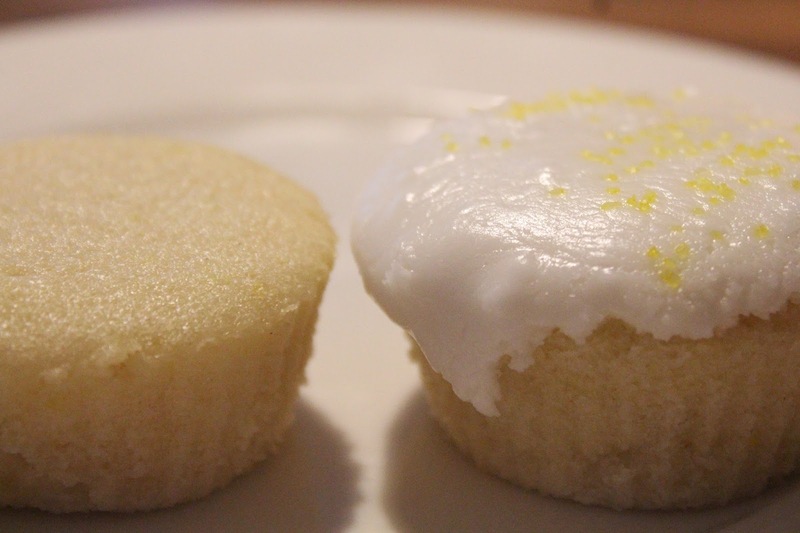 The baked cupcakes pulled away ever so slightly from the cups while baking, making them pop right out without even hardly trying. No falling apart and no leaving half of the cupcake behind in the liner (not that I would ever let that happen anyway). Not only do reusable cups like this save on paper and waste, but they’re also dishwasher safe. Laundry and kitchen cleaning are the two household chores I dislike most, so anything to make kitchen clean-up easier gets an extra thumbs up in my book. Enough about the baking cups. The cupcakes themselves did not disappoint. Although, it did take me a day to fully appreciate them. See, I have a problem where I never like what I bake right away. Whenever I try something right out of the oven, or even an hour later, I don’t think it tastes good. When I let some time pass and try it again later on, I will want to eat every last bite. So what changes in that time period? One theory I have is that while I’m baking, I’m usually taking tastes of the batter here and tastes of the frosting there, which may be suppressing my appetite. By the time the real thing is ready to go, I’m not as into it. Or, maybe it’s the idea that things simply taste better when other people make them for you. PB&J, Kraft Mac and Cheese…the simple childhood classics are always best when made by Mom or Dad, am I right? But I usually don’t have this problem when it comes to my own cooking. I’m almost always pleased with what I cook (as opposed to bake) straight off the bat. Whatever the case may be, in the end I loved these little citrus treats and I know you will too. 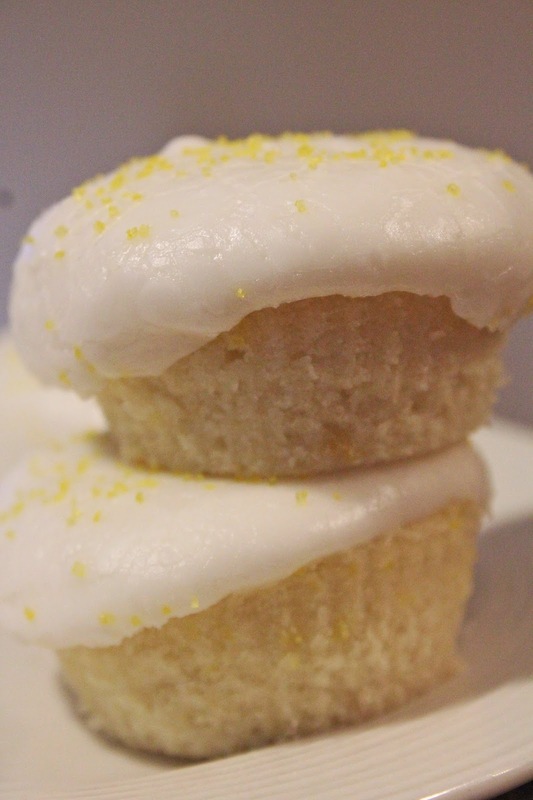 I followed Jessica’s recipe for Fluffy Lemon Cupcakes, only subbed homemade sugar frosting for the whipped coconut cream (only because I didn’t have the right kind of coconut milk on hand, but I look forward to trying it next time). If you’re interested in the silicone baking cups, you can purchase a 12-pack on Amazon for $11.95*. *I updated this post on 8/7/14 to reflect the increased price I was recently made aware of. This past weekend when I was being especially productive, I made a lot of cookies. 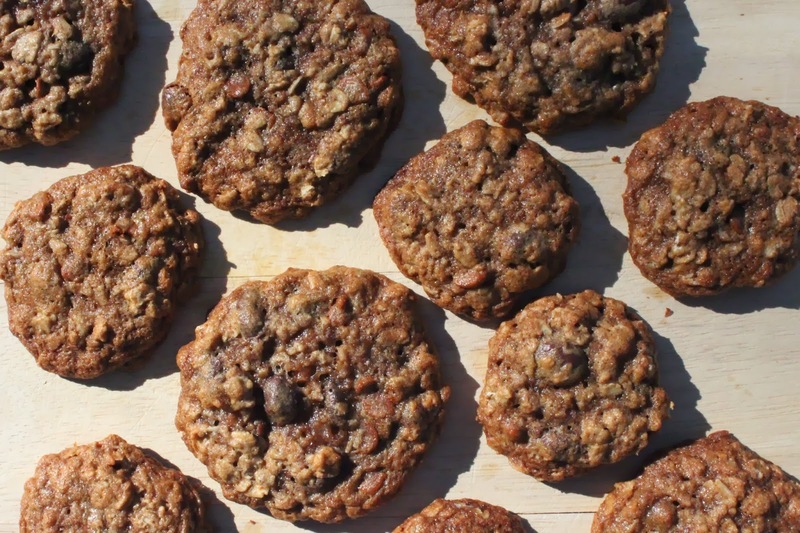 Baking cookies is the definition of productivity if you didn’t know. Of the two varieties I made, this being one and the other coming to the blog soon, neither turned out quite the way I expected, but I can’t complain. Expectations are a funny thing. It’s nice to have something to look forward to – a vacation, seeing someone for the first time in awhile, and the important things like eating a homemade cookie… – but when expectations aren’t met, what happens? Disappointment can ensue. Let me clarify. The cookies were not bad, and I really shouldn’t say I was disappointed, but they were different than what I was originally hoping. 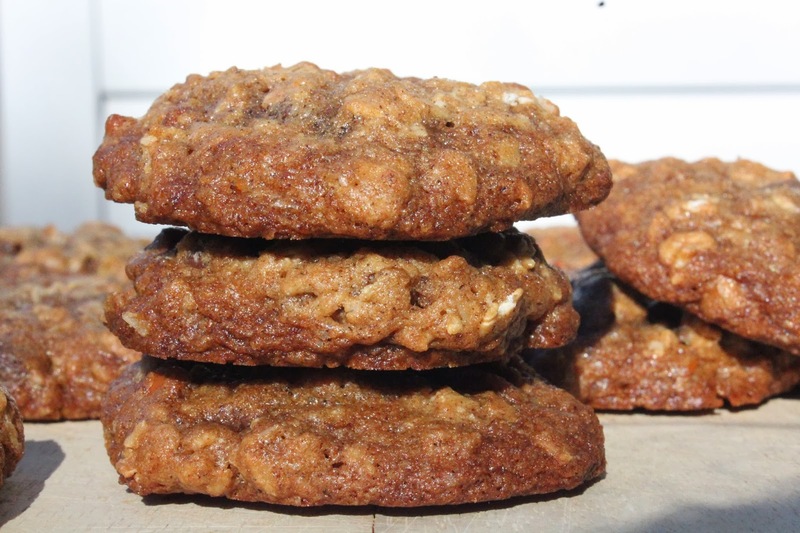 The good: They were full of texture, not overly sweet, and the warm cinnamony flavor (from both ground cinnamon and cinnamon chips) made them perfect to be called a “breakfast cookie” if you so desire. The bad: What they were lacking were enough Raisinets. I had a box (about 1/2 cup total) of dark chocolate Raisinets and was giddy over the idea of incorporating them into the cookie dough. But I needed MORE! One box was simply not enough to live up to my expectations. The solution(s): A. 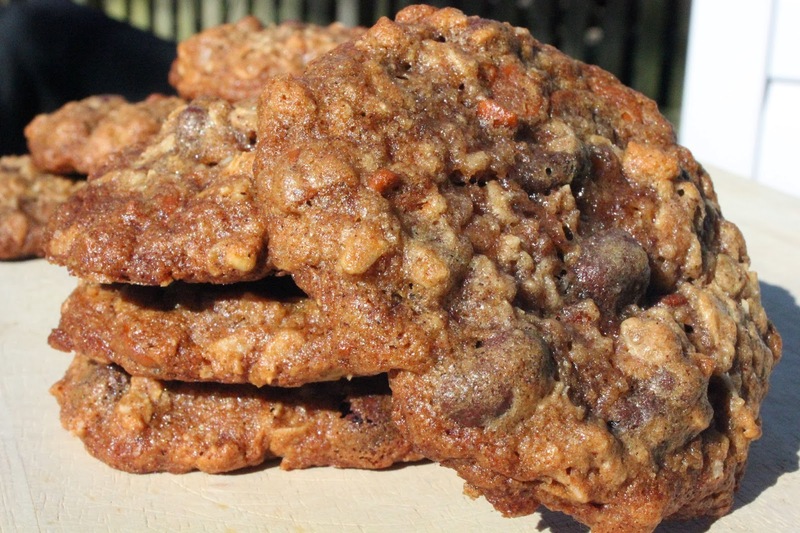 From the beginning, expect a cinnamon oatmeal cookie with an occasional dark chocolate raisin surprise or B. Double the amount of Raisinets. If you chose option B, please let me know how it is. 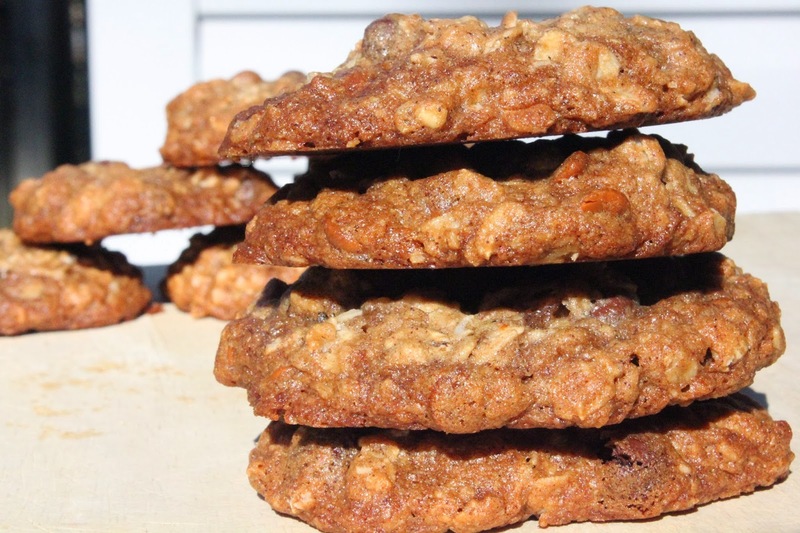 Once I took a second bite and got over the initial feeling of these not living up to my expectations, I quickly realized what I created was just as good as my original idea. The moral of the story: let go of expectations and take one step in life (or one bite of cookie) at a time. …Easier said than done, right? 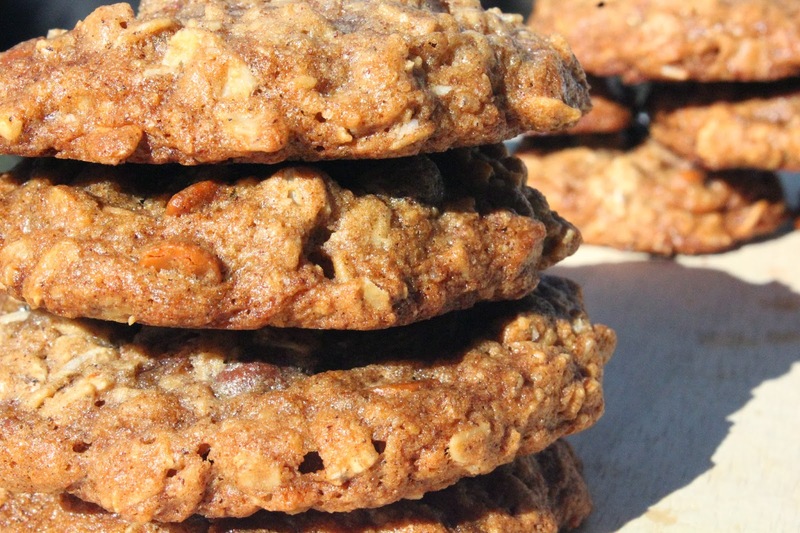 One day, I’m sure I’ll get around to meeting those Raisinet overload cookies that formed in my head, but until then I have other cookie recipes to tackle. I have a difficult time repeating or trying to re-do a recipe when I have hundreds of others catching my eye. 1. In a medium bowl combine flour, cinnamon and baking soda. 2. In a separate bowl add the butter and beat with a handheld mixer until creamy. Add sugars and beat again until creamy. Add egg and vanilla extract and beat until well combined. Add dry ingredients to the wet ingredients in two batches, beating on medium-low speed until just incorporated. Add oats and beat again until just combined. Fold in Raisinets and cinnamon chips. Chill in fridge for 20-30 minutes. 3. Preheat oven to 350 degrees. Scoop dough into golf ball size balls and place about two inches apart on a cookie sheet (use silpat mats or spray cookie sheets with nonstick spray). 4. Bake for 16-18 minutes. Remove from oven and let cool 5-10 minutes before moving to cooling rack. Enjoy! For someone like myself who lives and breathes by lists and schedules, the past week or two have felt very scattered. I can’t seem to get in a solid routine, but somehow I’m managing just fine. Turns out maybe an unorganized life is good for the soul every now and then. My blog posting has been off for a couple of days and I’m quickly trying to play catch-up. I feel like I say that all the time, but…real life beats internet life when it’s all said and done. Hashtag sorry I’m not sorry. My mom and step-dad were in town this past weekend, and I had the day off of work Monday for Presidents’ Day. My days are still thrown off from the long weekend, and with a few after-work events this week, it’s not about to slow down. One of these events is a cook-off hosted by Food Lion tonight. This experience will be completely new to me and I’m fairly anxious about the whole idea of it. I’m trying not to think or worry too much right now and go with the flow of things when I arrive. I’ll be posting more about that after the competition though. Pray for my cooking skills and knowledge to shine as much as possible! 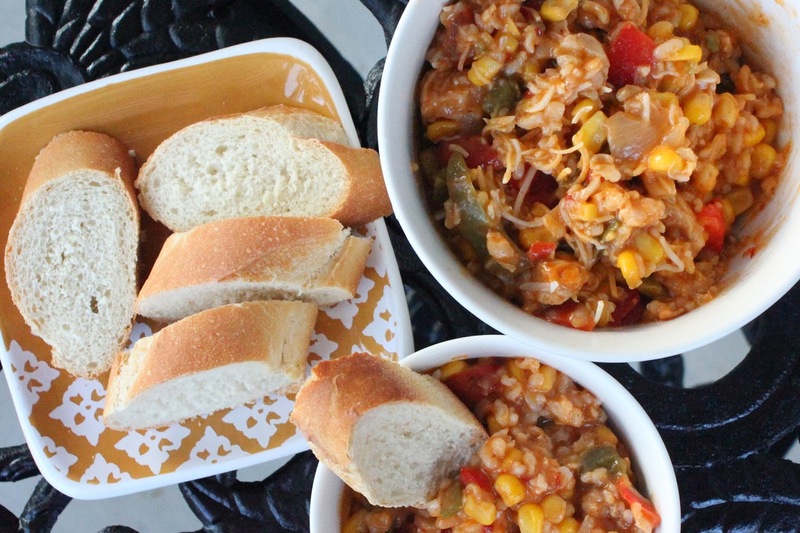 A lot of the ingredients and rules of the competition are still unknown, but if I get a chance to make this fajita chowder, you can bet I will. I would put money on this any day. 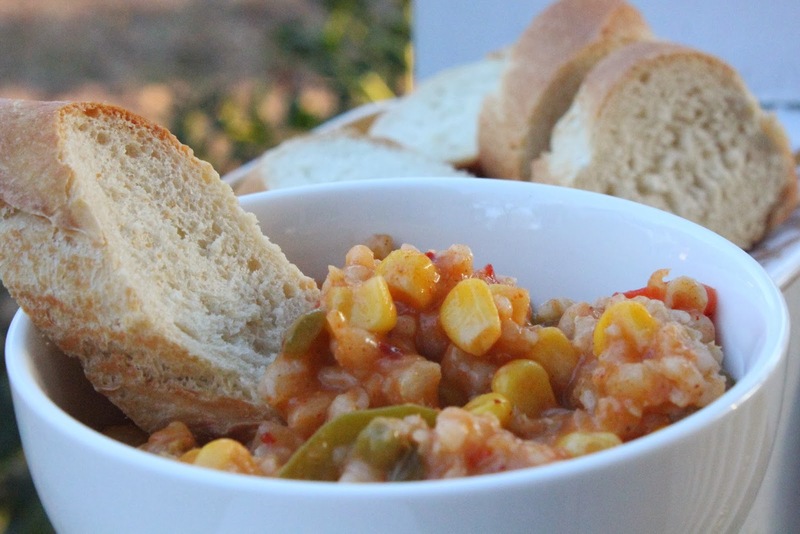 Between the nutty brown rice, tender vegetables, chunks of chicken and crusty bread for scooping, a bowl of this will leave you, well, wanting another bowl. Fun fact – This was the first time I have cooked with chicken since I transitioned to a heavily plant-based diet almost two years ago. In case you’re wondering, I do still eat meat occasionally, but mostly only while eating out if the vegetarian options on a menu don’t appeal to me. I can’t handle meat in as large of portions as normally served though. It just doesn’t sit well with my stomach. A few chunks of chicken throughout these bowls was just enough. 1. Add olive oil to a large, deep skillet on a stovetop over medium-low heat. 2. 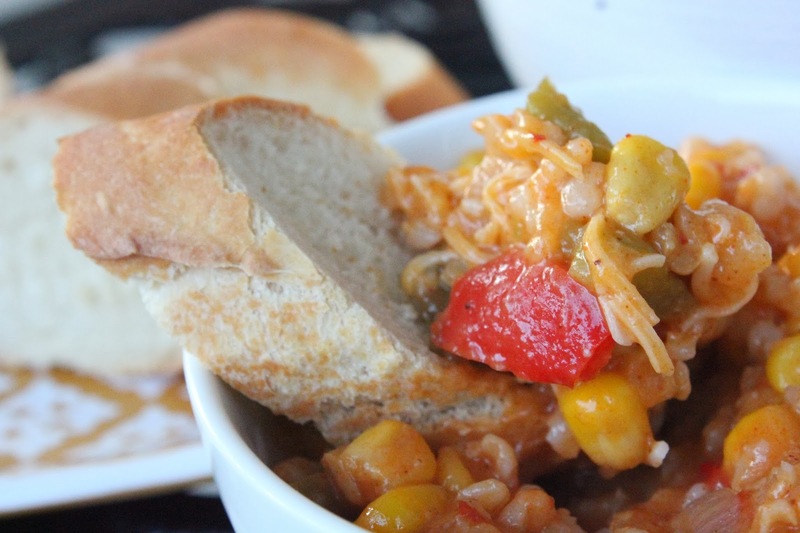 Once hot, add chicken, bell peppers, onion and jalapeno. Cook until tender, about 10 minutes. 3. 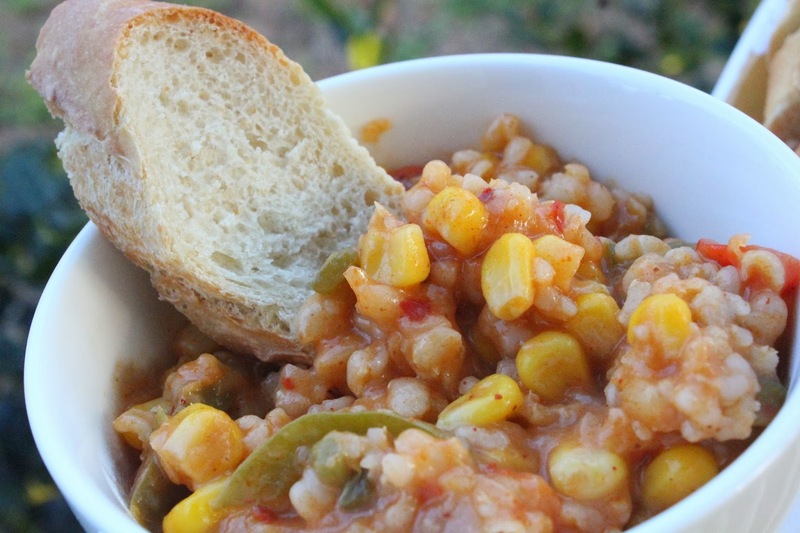 Add vegetable broth, dry rice, corn, seasonings, hot sauce and enchilada sauce. Bring to a simmer, turn heat to low, cover and cook for about 30-35 minutes, stirring occasionally. Add about half of the shredded cheese and gently stir to incorporate. Spoon into serving bowls and top with additional shredded cheese as desired. As freezing temperatures sweep through Charleston this week, I am going to pretend it’s actually summer until it comes true. 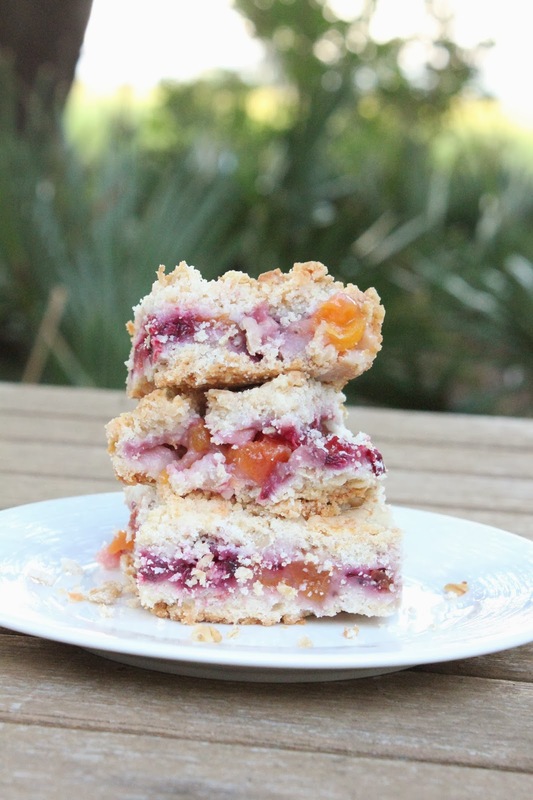 Crumbly fruit bars are just one way to pretend it’s summertime. 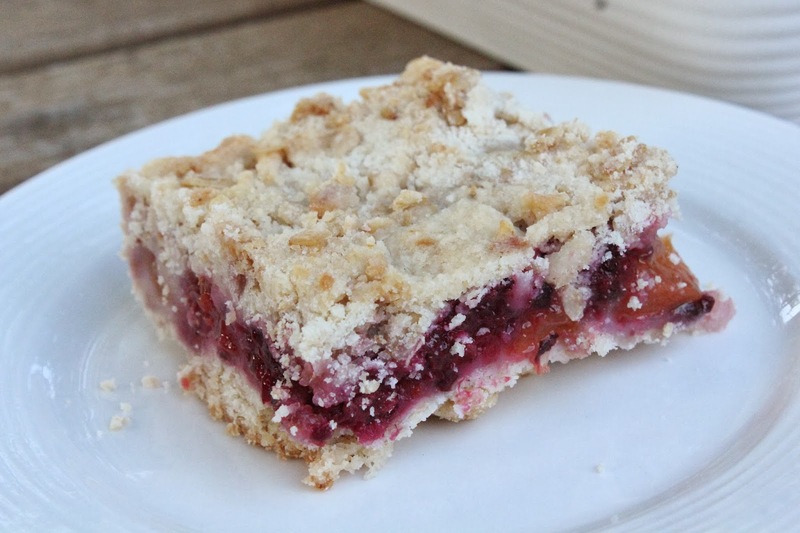 If you’ve never tried the blackberry-peach combination, get on it. Besides the pretty colors, the flavor can’t be beat. 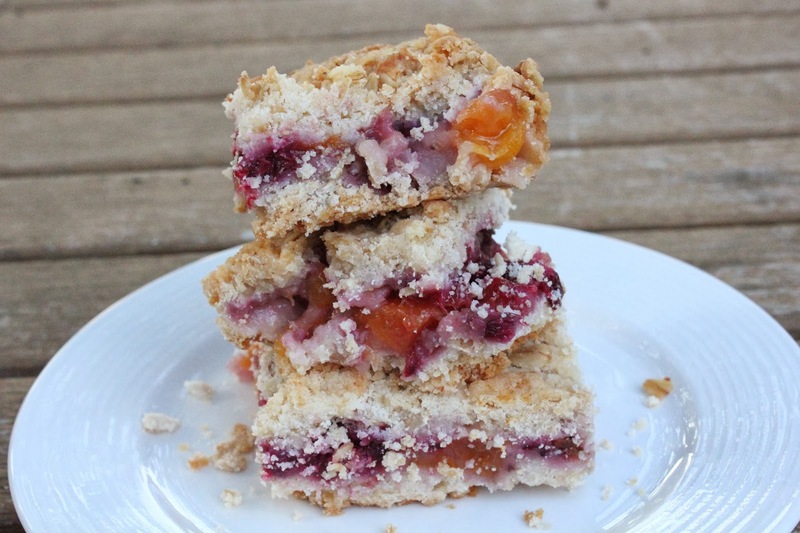 With these bars, the juicy fruits are pressed between two layers of crisp, buttery oats. Warm, summery smiles all around, guaranteed. What are “summery smiles” you ask? I don’t know exactly. I made it up. But I imagine we smile a whole lot more in the summer than in the winter. An easy-going kind of smile that just comes naturally in the warm and sunny weather. Not the forced ouch-this-hurts-my-dry-crackling-skin kind of wintertime smile. I’m keeping things short and sweet (no pun intended) around here today, because the pictures speak for themselves. In full disclosure, I actually did make these bars last summer, hence all of the lively greenery in the background. However I’m sure they will be equally as wonderful with a backdrop of snow (or freezing rain in my case…). Like I said, FAKE IT ’til you make it. 1. Preheat oven to 375 degrees. Grease a 9×9 inch pan and set aside. 2. In a medium bowl, combine 3/4 cup of the sugar, baking powder, flour and salt. Cut in the butter pieces and egg until butter chunks become size of peas. Spread half of this mixture in the bottom of the pan. Press down to form the crust. 3. In a separate bowl, combine remaining 1/2 cup of sugar, cornstarch and lemon juice. Mix in the chopped blackberries and peaches and stir to combine. Spread this fruit mixture over the crust in the pan. Crumble the rest of the flour mixture evenly over top of the fruit. 4. Bake 40-45 minutes or until the crumble on top is golden brown. Cool completely, cut into squares and serve. Refrigerate any remaining bars in an airtight container for up to five days. I remember staying home from school sick one day in sixth or seventh grade and my mom rented the movie Fried Green Tomatoes for me to watch. I didn’t have high expectations at first. It seemed like an “old” movie (came out in 1991, ha!). Wouldn’t you know, I watched every minute and loved it. 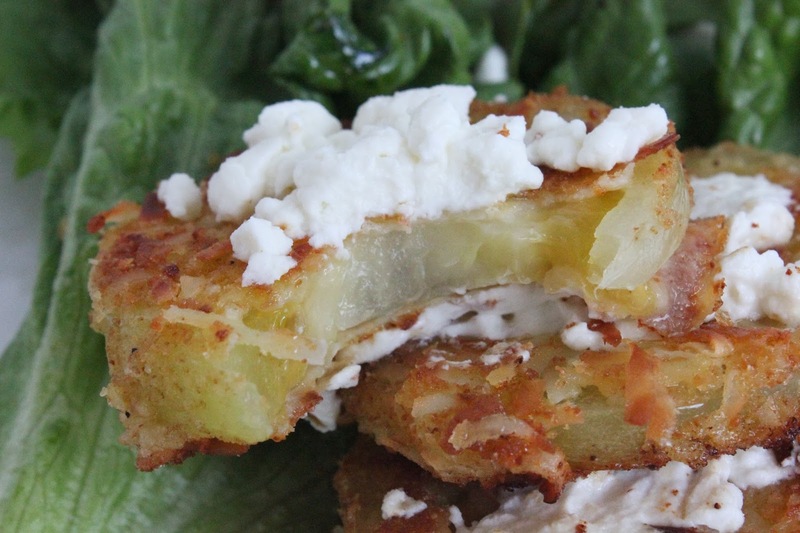 If you’ve seen the movie, you know there’s a whole lot more to the story than fried green tomatoes. It’s a story of best friends, an abusive relationship, illness and even a murder. Lots of drama, but lots of love that warms your heart. The perfect sick-day movie if you ask me. At the time I first saw this movie, I was a picky adolescent girl living in the Midwest. 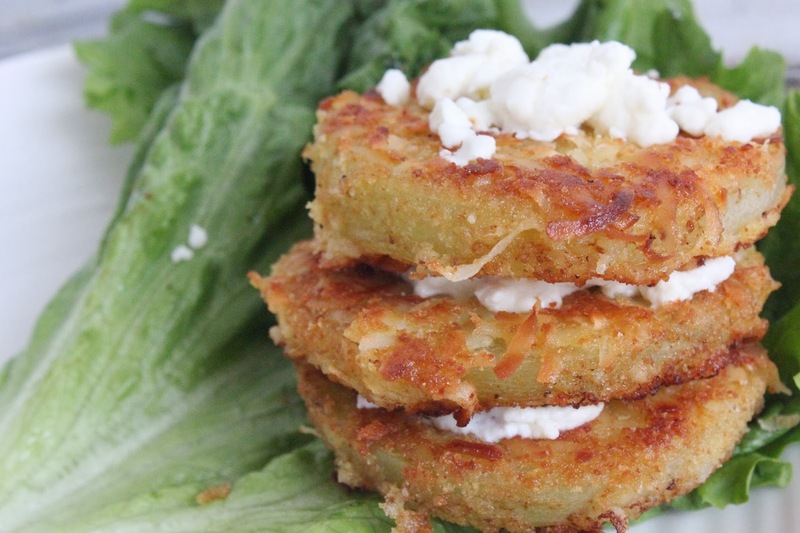 I hadn’t heard of fried green tomatoes, let alone have any interest in tasting one. Fast forward a few years and I found myself not only in the South, but living in one of the most culinary rich cities in the country. My taste buds quickly expanded and fried green tomatoes became my friend…along with shrimp and grits, scallops and pralines. There are many foods that define the South, and I’m fairly certain fried green tomatoes are one of them. This weekend when I was picking up some produce from Boone Hall Farms, I spotted an entire bin full of the bright green fruit. I eagerly snagged a few for my basket and dreamed of some crispy tomato medallions the whole way home. 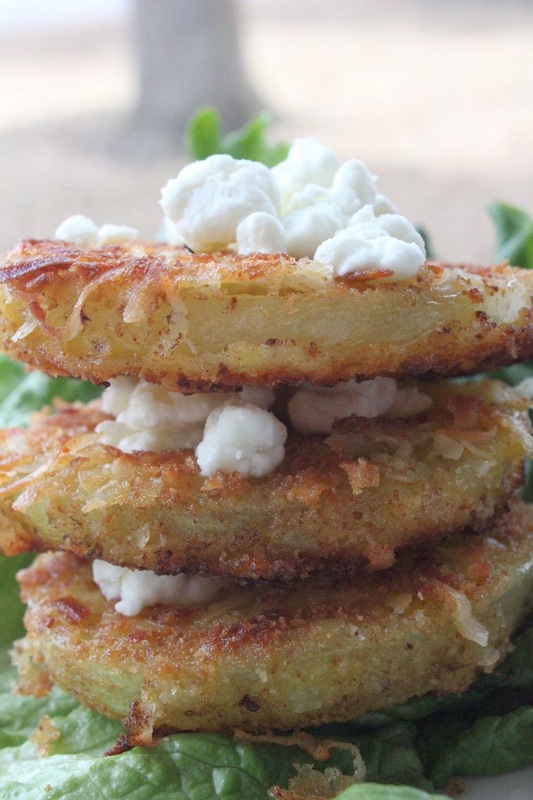 These aren’t your typical fried green tomatoes though. The secret (not really a secret when it’s in the title), is shredded coconut. 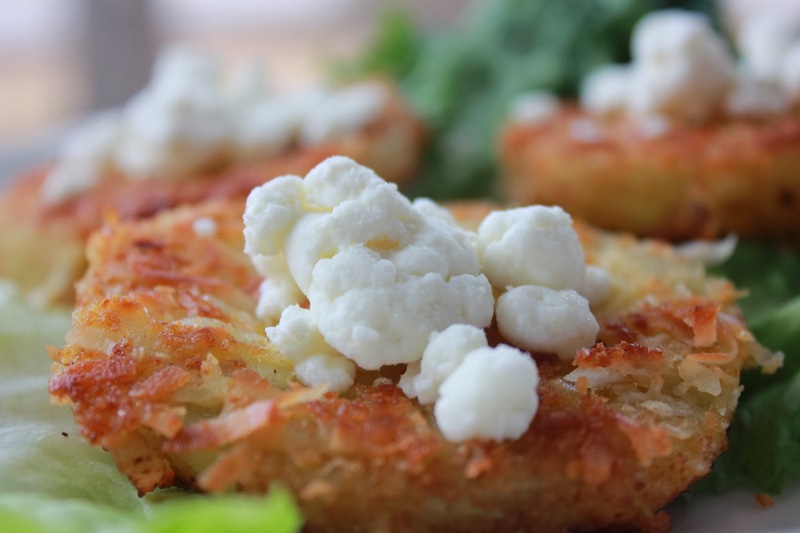 The sweet flakes add something special to this dish and only goat cheese could make it better. Of course the man in the house was disgusted with “the white stuff on top” so leave it off if you must, but I wouldn’t condone it. 1. In a large skillet, heat olive oil over medium-low heat. 2. Meanwhile, slice tomatoes in 1/4 inch thick slices. In one small bowl, add the flour. In another small bowl, mix breadcrumbs and coconut flakes. In a third bowl, gently whisk together the egg and buttermilk. Dip each tomato slice first in the flour, followed by the egg mixture, and finally in the breadcrumb mixture. Make sure the entire slice is coated in each mixture before dipping in the next. 3. When oil is hot, add tomato slices to the pan. Let cook about 2-3 minutes on each side or until slices are golden brown. Remove from pan and gently pat with paper towels to soak up extra oil. 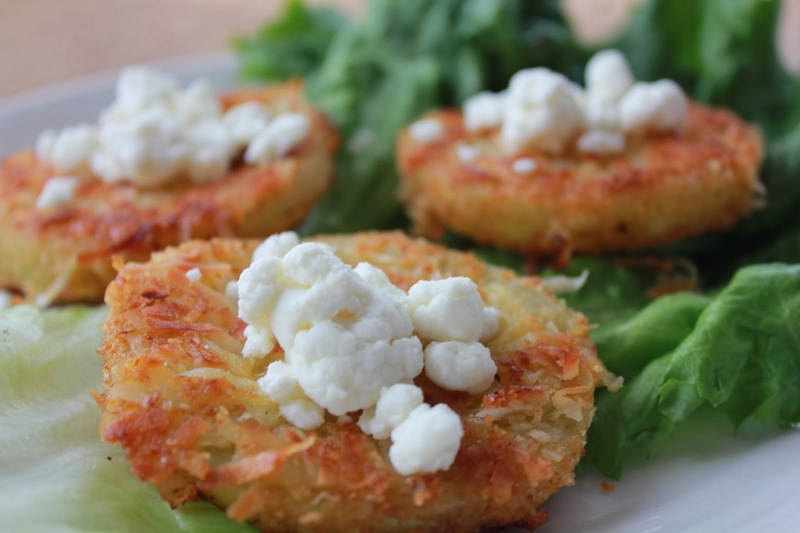 Top each slice with about one tablespoon of goat cheese and serve immediately.